We offer a range of design and consultation services. To see more of our design work, check out this blog post. Choosing the right plants for your situation can be confusing and even overwhelming. 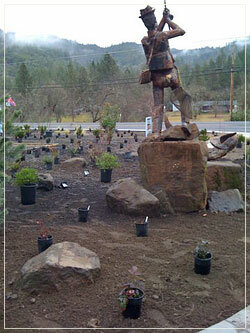 Shooting Star encourages customers to bring photographs, measurements, and drawings of planting areas. As time allows, willing staff members will assist with plant selection and offer design tips for your particular project. Please remember to note the direction of North on your drawings. You may download and print our design questionnaire to provide more detailed information. With personal attention, the staff at Shooting Star can help you visualize the plants in your garden, make plant lists, and provide estimates. Please note that on-site help may be limited to availability of staff and subject to interruption. For more extensive assistance, design and consultation appointments are available. With two designers on staff, Shooting Star offers design services tailored to suit your needs. 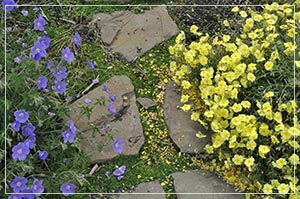 Serving both residential and commercial customers, options include development of custom plant lists, advice on soil improvement, or editing of an existing landscape. Christie or Bonni will come to your site for an assessment. They can assist with anything from an overgrown bed that needs refreshing to a complete design and planting scheme. We can even do potted arrangements – no job is too small. Designers will visit your site to discuss the scope of your project and develop a design. Our designs are hand drawn and are accompanied by a plant list to assist in your plant research. 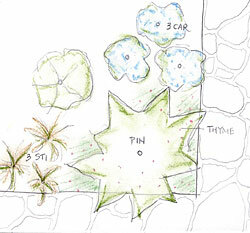 Many times, a rough sketch is all that is needed to articulate your vision and create a planting composition. For larger projects, the designer will develop hand drawn, measured, scaled, and precise drawings that can be completed back at our office. Customers often meet with the designer at the nursery for direct involvement in plant selection. 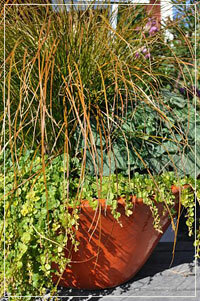 By making a design appointment you will receive 10% off all of the plants used in your design. Please call or email to discuss your project and our rates. 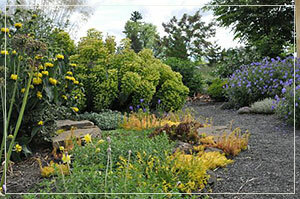 Shooting Star designers specialize in design, plant selection, layout, and consultation. We do not provide detailed plans for engineered hardscape such as decks, patios, sidewalks, and retaining walls, but will take them into account in your planting design. 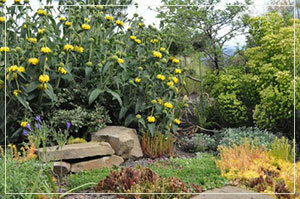 We do not install or maintain landscapes, but will offer consultation on maintenance, care, and pruning. With two designers on staff, Shooting Star offers design services tailored to suit your needs. "This is a GREAT nursery. Friends recommended it to me a couple of years ago, and I've been a regular customer ever since." "When I find the right professional, I hang on tight and recommend them like crazy. Christie at Shooting Star Nursery is one of those pros. Highly knowledgeable, grounded (pun intended), smart, fun and creative. The business she and her husband have built speaks to taking care of our Planet as well, which was at the top of our list. From the initial onsite consultation to the plan to the list to the planting - it was all smooth, easy and encouraging. We wanted edibles and we got them and have learned a lot along the way already. Without a doubt, SSN is my first choice as a home and property owner. As a business owner I also appreciate her receptivity and thoughtfulness and huge value she offers. 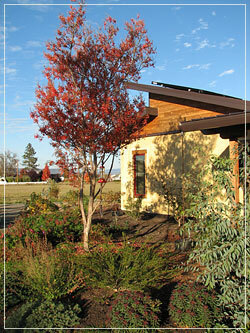 Thanks, Christie, Scott & Crew for helping us live carefully with our landscape."